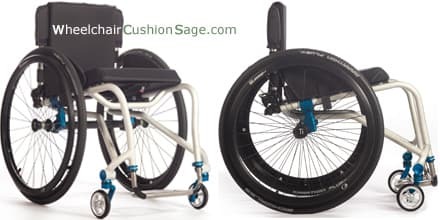 The TiLite Aero T wheelchair can generally be categorized as an ultra-light wheelchair due to its exceptionally light weight (<20 pounds depending upon configuration). TiLite—the manufacturer of this product—specifies this wheelchair as follows. The Aero T chair could be loosely considered an aluminum version of TiLite's titanium TR chair. When compared to TiLite's titanium TR chair, the Aero T chair does exhibit a few differences (e.g., standard TR taper options are Aero T custom modifications, etc.). The frame and other chair features can be custom-manufactured in a variety of ways as indicated on the order form.